This unusual converted horse wagon offers luxurious glamping accommodation, with the added benefit of all the facilities on offer at Brooks Country House Hotel. 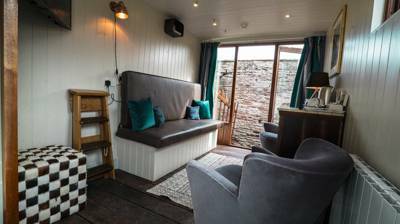 This unusual, quirky converted horse wagon offers luxurious glamping accommodation, with the added benefit of all the facilities on offer at Brooks Country House Hotel, a stunning 22-bedroom Georgian manor, including a sauna and an outdoor heated swimming pool (June-Sept only). This horsebox can accommodation 2 adults and 2 children up to the age of 12 years in the king-size double bed and 2 bunk beds. Crisp white linen and fluffy bath sheets. Cots and high chairs available, please request at time of booking. The apartment sleeps up to 6 people – there are two double en-suite bedrooms and also a sofa bed in the lounge. You can take your dog with you (but they're not allowed to sleep in the bedrooms).